All right, there was no red carpet at the entrance. And the biggest stars in the building were Hall of Famer Thurman Thomas and Buffalo News reporter Vic Carucci. I was still quite happy to be there, though. It was the debut of the documentary, “Ralph,” which will air on WNED-TV on Dec. 15. 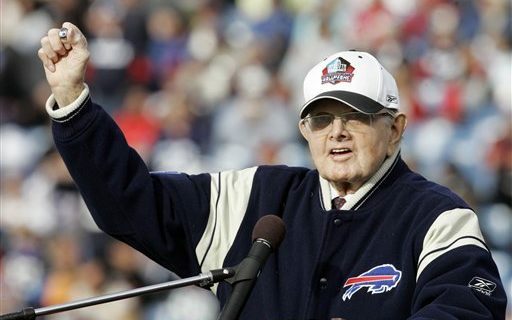 It’s a nice tribute to the life of the late Ralph Wilson, who owned the Buffalo Bills for more than 50 years. Bills fans definitely will like it. Chris Berman lent his voice to the narration of the program, and the Wilson family supplied some photos, etc. as well as interviews. Plenty of other voices pop up, including those of Thomas, Carucci, Marv Levy, Jim Kelly, etc. Wilson gets full credit for bringing a pro football team to Buffalo in 1960, and keeping it here. And deservedly so. Those are a couple of big pluses when it comes to measuring Wilson’s contributions to the area. Still, there was one point that went more or less unsaid in the program. The Bills had 21 winning seasons in the 54 years that he owned the team, and only the two AFL championships in 1964 and 1965. Why didn’t the team win more? I had some thoughts on that issue, but thought it would be a good idea to check with someone who had been following the fortunes of the Bills for decades. I made the call when I got back from the documentary to see if I was on the right track. When I asked my source about the lack of wins, he came back with a one-word answer: loyalty. Wilson was loyal to his employees, who in many cases were or became his friends. But sometimes he was too loyal, and that’s not a recipe for success in the cutthroat NFL. Wilson hired many different people as general manager over those 54 years, and some of them were not good fits for the demands of the job. That principle probably can be used to describe other members of the organization. Who else would have hired Harvey Johnson as interim coach … twice? The first strong GM hired by the Bills probably was Bill Polian in the mid-1980s. Even though he won, he and Wilson eventually went their separate ways – although there was blame to place on both sides in that situation. It’s also easy to guess that Wilson didn’t change his methods enough as the football business evolved drastically in a half-century. The NFL was a much different arena in 1971 than it was in 2011. There are stories about how the Bills trailed the rest of the league in marketing, and that Wilson had a one-word answer – “no” – to suggestions on changing the operation. In addition, Wilson never put a great deal of value on a head coach. There were only a few times when the Bills went out and paid top dollar for the best coach available. The list probably starts with John Rauch in 1969, and ends with Chuck Knox in 1978. It does not include Levy, who Polian picked for the post as he rebuilt the football operation. Bad luck also affected the team occasionally. Certainly the hiring of Tom Donahoe was considered a great move at the time. He was part of a consistently successful team in Pittsburgh, but Donahoe couldn’t generate those same results as a boss in Buffalo – and made few friends along the way. Who saw that coming? Wilson had an odd ride in terms of his relationship with fans during his time with the team. I assume he was celebrated for bringing a team here in 1960. Once that was taken for granted, he was toasted during the good times and roasted during the bad ones. It comes with the job. When Buffalo fielded awful teams in the 1970s and 1980s, Wilson certainly got a share of the criticism. But in the last decade or so of his life, the attitude appeared to change a bit. The fans around Western New York still loved their Bills, and they realized that it would have been easy to move or sell the team to a bigger market and earn a ton of money. Any anger over the playoff drought focused on the team executives, and not the owner. Ralph became something of the revered grandfather to the entire region. Besides, Wilson’s good deeds to the Buffalo community have kept adding up. Millions of dollars have come down the road from Detroit to fund medical facilities, scholarships, nonprofits organizations, etc. It’s a legacy that will continue for years to come, as the money from the sale of the team (more than $1 billion) has gone to a foundation that has made donations to several causes in Detroit and Buffalo. We all should be so lucky to be remembered for our generosity and loyalty toward others. Few would trade that for a few more wins on the football field.